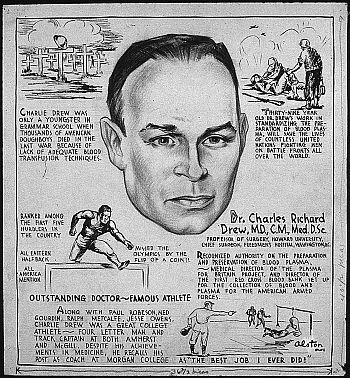 Probably, there wouldn’t have been anything like the American Red Cross blood program of today, if not for men like Dr. Charles Richard Drew. He was not only a great pioneer in Medical Science (especially in area of blood banking), but was also one of the first to speak out against racial injustices, and in turn has become a perceived martyr for the African American Race. His groundbreaking work in the large-scale production of human plasma was eventually used by the U.S. Army and the American Red Cross as the basis for blood banks. Dr. Drew was born on June 3rd, 1904 in Washington D.C; he had a charmed childhood where he excelled in various sports with a record of academic excellent. He earned a Bachelor of Arts from Amherst University, where he graduated with honors in 1926. He received a Medical Doctorate (M.D.) and Master of Surgery (C.M.) from McGill University (where he began his blood research,) Montreal, Quebec in 1933. After his several internships in Canada, he became Instructor in Pathology at Howard University in 1936 as well as an Assistant in Surgery, where he worked on his ideas for blood preservation. Dr. Drew showed such promise in his work at Howard University that in 1938, at a time when war clouds were gathering over Europe, he was recommended for one of the Rockefeller fellowships at Columbia aimed at promoting advanced training in all fields of medicine. Dr. Drew organized the World’s first blood bank in London during World War II. This he did by removing blood cells (plasma) from blood; he lengthened the shelf life of stored blood. Prior to initiating the blood bank in London, he established the Red Cross Association and eventually became the first director in 1940’s he became well known for his work and received many honors and rewards. In 1941, Drew resigned his position (with the Untied States Army) after the war department sent out orders that blood taken from white donors should not be mixed with black donors. This issue caused wide spread controversy. Drew referred to this as “a stupid blunder”. He said that there was no scientific basis to indicate any difference in human blood from race to race. He returned to Howard University to teach surgery. Around this time, in spite of prolific black inventors like George Carver and Banneker having proved time and again that race and intelligence do not have much correlation, the faulty theories of racial differences were still popular. Drew’s decision needs to be viewed in this context. However before his controversial death, Dr. Drew recorded great achievements both in the medical line and his pursuit again racial injustice. These includes Washington Medical Director (1946-1947), Surgical Consultant, ETO (Army), Director of the first Plasma Division, Blood Transfusion Association, supplying plasma to the British (1940-1941), First Director, A.R.C. Blood Bank, supplying blood to the U.S. forces (1941), America-Soviet Science Commission (1944) and Spingarn Medal (1944) among others. Mankind suffered a great loss in 1950 when, at the age of 45, Dr. Drew was killed in an automobile accident while driving to a scientific conference. His life was short but very significant to us.